I re-read Heather Dixon's Entwined this past month. I hadn't read it since it was released back in 2011 (linked to my thoughts). I loved it and stuck it up on my bookshelf to be read at some point in the future. I was reading the story of The Twelve Dancing Princesses aloud to my daughter back in January and that's what reminded me of Dixon's retelling. I felt like the future was now and the book was meant to be re-read. I've refrained from reading my original thoughts on the book until I complete writing down my thoughts this go around. 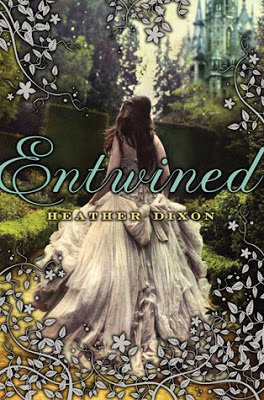 As I say, Entwined is a retelling of the classic fairy tale, The Twelve Dancing Princesses. Dixon uses all of the original elements of the story in telling her own which I think makes it extra fun as you read things both familiar and new. The kingdom is thrown into mourning when the Queen dies which, for the princesses, means an abrupt end to their dancing. The princesses must navigate a world without their mother and with their father, the king, whom they barely know. They are frustrated and vexed by the limitations placed on them during mourning and find a way to continue dancing. Trow in some magic and an intriguing villain and you've got yourself a very engaging story. This story slowly unfolds, releasing bits and pieces of information as you read along so I'll be careful not to offer any spoilers. Suffice it to say that this book is incredibly entertaining and just plain good fun. It's a story that is easy to get lost in. The characters are interesting and you are left guessing at how things are ultimately going to play out. My only complaint about this book is that Dixon is something of a weak writer. There are some eye-rolling moments but this being her debut novel I still think it stands up and shines despite some deficiencies. Her imagination is clearly is top notch working order and she keeps things moving at a nice clip. The book is clean, free from foul language, or from any "scenes" which makes this a book you can relax into. I really can't think of a single thing to offer as a warning against reading this book. The only word that keeps coming to mind in describing it is, "fun!" I feel like I'm writing a "nothing" of a review. As mentioned, I wanted to be careful to write up my fresh thoughts before going back and reading my old review. I think my previous shared thoughts are much more comprehensive. If you want to know more specifics about the book, see what I had to say back in 2011. The only thing I would change in my position is in saying that the villain isn't as creepy as I once thought him to be. I had no such qualms with the book this time around, nor any trouble sleeping. The guy is still a little creepy but not so much that I'd issue a caution. As villains go, he's fairly tame. Anyway, I was glad to take some time to re-read this title and I liked it so much I'm happy to slip it back on the bookshelf for a few years in order that I might pull it down and enjoy it again at some point. I still recommend it for a great reading time!